Paterson, New Jersey was home to poet William Carlos Williams (1883-1963), whose five-book epic poem Paterson explored its people and history. The city supplied the experimental poet with the substance of American ideologies, through which he sought no small task: to find the essence of human life. Although not so ambitious or sweeping as Williams’ free verse, Jim Jarmusch’s film Paterson takes place in the same city and is about poetry in more ways than one. The film revels in scenes that take us down Paterson’s narrow streets, along its brick buildings, or simply rests on a park bench to observe the beauty of its Great Falls. Its characters, among them Jarmusch’s protagonist, also named Paterson, even discuss Williams’ influence. 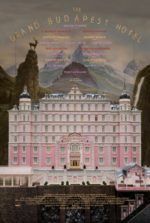 And however winking it may seem to name the main character and title of a film after a place, these multitextual meanings create an intricate, albeit effortlessly beautiful and rather profound film. 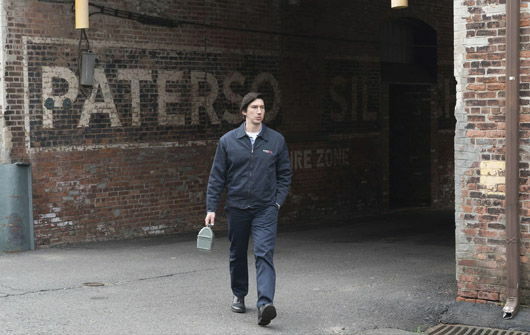 Adam Driver plays Paterson with a humble, unassuming presence, always contemplative and quietly bemused by his surroundings. He shares a modest home with his significant other, Laura (Golshifteh Farahani), an aspiring interior designer, cupcake aficionado, and country music star who hopes for fame and recognition. Paterson, too, is an artist, writing poetry in a small notebook he carries with him always. For work, he drives a city bus in a kind of half-conscious manner, always with a part of his mind on lines of his poetry, which he finally scrolls down during his lunch break. Paterson is another of Jarmusch’s contemplative, interior characters whose way of life is a pleasure to discover. Like the vampire couple played by Tilda Swinton and Tom Hiddleston in Jarmusch’s Only Lovers Left Alive (2013), Paterson and Laura live by an unspoken philosophy but a certain love. Paterson is a poem. Each day opens with titles and proceeds like a stanza, with familiar verses and visual passages that seem to rhyme in their details. The story takes place over a week, beginning on a Monday and ending on a Sunday, and each day contains similar beats. Paterson wakes around 6:15 am next to Laura, not by an alarm but an internal clock, perhaps informed by Jarmusch’s glances up to a framed photo of Paterson in a Marine uniform. He eats breakfast and, while waiting for his shift to begin at the bus depot, he composes the first lines of his poem for the day. Throughout his shift behind the wheel, he listens to passengers chatting and smiles at their conversations. During his lunch he sits at the falls, jotting down poems in nonstructural order. At the end of the day, he walks home and finds Laura deeply involved in her art project for the day. After dinner, he walks Marvin, their English bulldog, down to the corner bar where he talks to characters, like the bartender named Doc (Barry Shabaka Henley). The joy within Jarmusch’s poetic structure resides in first discovering the routine, but then the small variations from the routine. For instance, each day upon arriving home from work, Paterson finds the mailbox post tipped slightly; he fixes it upright, only to find it crooked again the next day. But eventually Jarmusch shows us the cause, and it’s this sort of break from the structure’s arrangement that is delightful and funny. Each such flourish culminates and seems to press upon Paterson’s comfortable pattern: his bus breaks down; there’s an unexpected outburst at the corner bar; one of Laura’s artistic endeavors pays off; ever jealous of Paterson and Laura, Marvin acts out; Paterson receives a gift from a stranger. Though alone these moments might seem like inconsequential events, each deviation creates an emphasis that seems to build to the character’s life. None of the variations betray the overall poetic, observational structure of the film, however. Jarmusch has been exploring his own kind of visual poetry for years. Watch Dead Man, his 1995 Western starring Johnny Depp, or even just its opening sequence on a train going West. As Depp drifts into sleep and back to dreary alertness, he notices new passengers with him on the train car; and during each transition, Jarmusch fades to the train’s coupling rods rotating on the wheel to show the passage of time. Several Jarmusch titles follow a similar poetic arrangement as Paterson. To name a few, Mystery Train (1989), Night on Earth (1991), and Ghost Dog: The Way of the Samurai (1999). Though, only the writer-director’s latest marries form and function in a perfect mixture of narrative and technique. Even the delicate cinematography by Frederick Elmes, a frequent collaborator with both Jarmusch and David Lynch, had been blended by editor Affonso Gonçalves into multiple layers of footage that overlaps and evokes how thoughts are organized into the whole of a poem. Jarmusch has made a film that passes by with all the ease of a casual bus ride, the lyricism of one of Padgett’s poems (or even one by Williams), and the low-key assuredness of the director’s established style. Paterson contains an effortless quality that rolls off the screen; the viewer settles into a steady and exquisite demonstration of the filmmaker’s control over his craft and the depth of his artistry. While Driver remains a fascinating and sensitive character study, Farahani supports him in a quirky and endearing relationship that seems real in its sly imperfections yet obvious love. In true Williams form, Jarmusch finds sophistication and rich pleasures in the prosaic, ordinary lives of his characters. 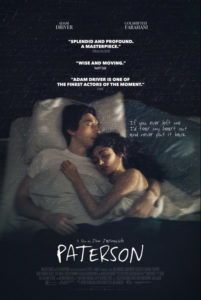 Somewhat muted and resistant to any manner of broad appeal, as most poetry tends to be, Paterson is a work of art in its embrace of poetic forms, and it becomes essential cinema for Jarmusch’s distinct traces and innovations on those forms.